I started this mini-kit design on May 11, 2000, just before I left for Ireland. I thought it would be a good portable project. Ha! This project needed an Ott Light for sure. Even enlarged, I had trouble following the chart. Like all kits, I ditched the Aida and replaced it with a 32 count Antique White Joblean. When I finished Dragon Ride in November 2001, I decided to put the needle to the fabric on this one and finish it up. I finished on the ides of March, 2002. As usual, Dan at Matte Ink did my framing. The only thing I added to the pattern was a layer of clear Prism over the Unicorn. 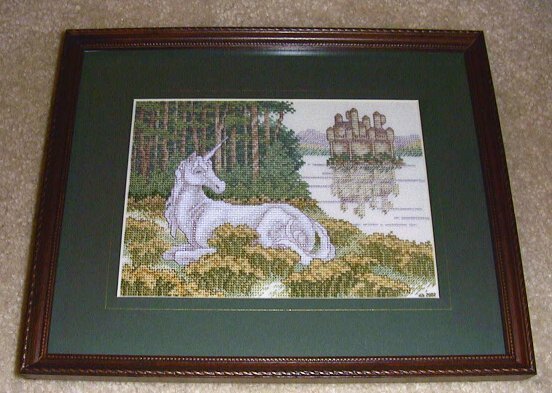 It isn't very glaring and doesn't show up at all in the picture, but it does give the Unicorn a slight mystical shimmer.